The Global Healthcare Services' Fall 2018 U.S. Healthcare Market Update written by GHS team members Todd Perman, Eric Murphy, and Will Burnette was published this month in Commercial Observer. The comprehensive report discusses the current state of the U.S. healthcare market, with special insight on the medical office investment market, healthcare M&A activity, and the Northeast market. To download GHS' Fall 2018 U.S. Healthcare Market Update, please click here. 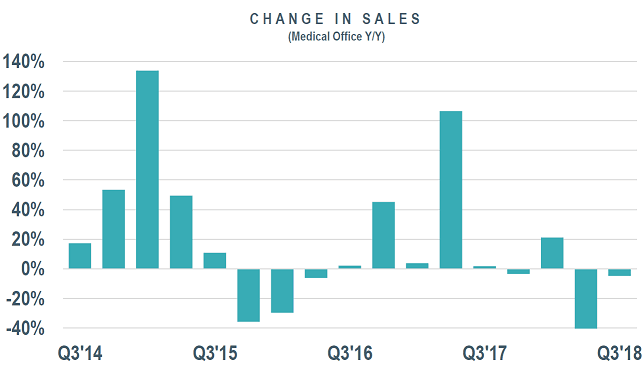 According to a recent report by Newmark Knight Frank, during 2017, medical office properties across the nation valued at $13.3 billion changed ownership, well above the $10.8 billion in 2016. 2018 has seen a decline in national sales volume with year over year total sales down by 17 percent (representing 164 properties) and volume in terms of dollars down by 18 percent, or $1.8 billion... Read the full article here.